For Interceil, this was their very first #GridOff competition, which is held to recognise Armstrong’s national network of Omega contractors. The “Curried Bull” Interceil team of Graham Bullock and Steve Curry conquered last year’s winners, Coyle Suspended Ceilings, by a mere two seconds. 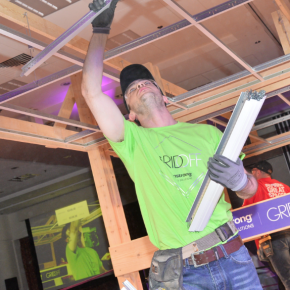 This nail-bitingly close final was the climax of the second #GridOff competition, which took place at Birmingham’s NEC on Wednesday March 14th. 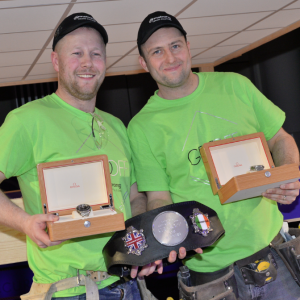 Graham and Steve (pictured hard at work in the above photo), had travelled from Northumberland with colleagues for the occasion, both scooped an Omega Seamaster Planet Ocean watch, plus the winner’s belt from the boxing-themed ceiling installation competition. Defending champions and runners-up ‘Team Coyle’, consisting of Kevin Coyle and Thomas Goodfellow, who travelled from Northern Ireland, bagged ringside tickets to the Haye-Bellew rematch bout. Compered once again by ‘the voice of boxing’ Steve Bunce, the competition attracted over 10 teams from the Omega network. 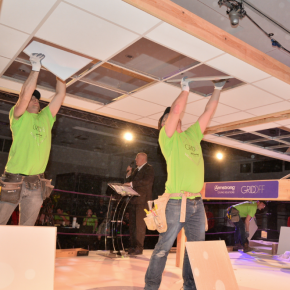 The installations in a mock boxing ring with two ceiling rigs were judged by Sebastien Nalin, from Armstrong’s suspension systems arm, and Ian Young, manager of Armstrong’s installation training centre in Gateshead. Interceil completed their final installation in 05:14:80 (including 10 penalty seconds) made more unbelievable given the pair do not usually work together. Coyle were narrowly nosed out in the final, clocking a time of 05:16:99. Interceil’s Steve Curry said he was ‘totally over the moon’ to win, whilst Graham said they felt at the time they were doing better in the final than in the first round. 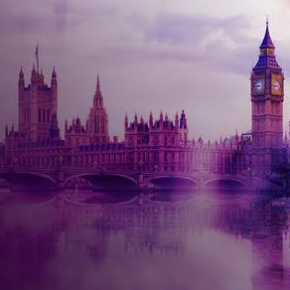 Interceil’s MD, Steve Jones, said Interceil were ‘so very proud to be involved in this amazing day’, adding how social media in the north east had ‘gone crazy’. He praised Armstrong for providing a platform for the competition, saying it was both ‘fantastic and very rare,’ that they are receiving plaudits. 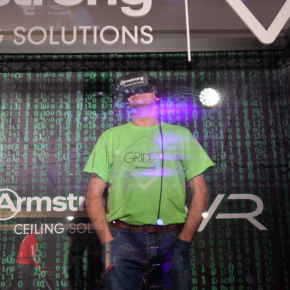 Attendees also experienced a fun virtual reality ceiling installation, which saw education meet entertainment in an immersive showcase application. 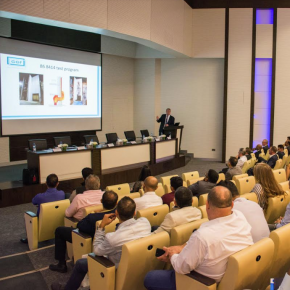 Hamza Abbas, director of VR company Lucas Studios, talked about the #GridOff event. “It’s taking the excitement away from the VR and that usually doesn’t happen. The way it has been set up, the whole boxing thing, is the best way to glorify your partners. For a second they are the ones in the spotlight,” he said.